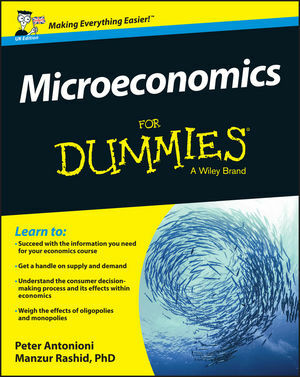 Microeconomics For Dummies (with content specific to the UK reader) is designed to help you understand the economics of individuals. Using concise explanations and accessible content that tracks directly to an undergraduate course, this book provides a student-focused course supplement with an in-depth examination of each topic. This invaluable companion provides clear information and real-world examples that bring microeconomics to life and introduces you to all the key concepts. From supply and demand to market competition, you'll understand how the economy works on an individual level, and how it affects you every day. Before long, you'll be conversant in consumers, costs, and competition. Microeconomics is all about the behaviour of individual people and individual firms. It sounds pretty straightforward, but it gets complicated early on. You may not be an economist, but if you're a business student at university, the odds are you need to come to grips with microeconomics. That's where Microeconomics For Dummies comes in, walking you through the fundamental concepts and giving you the understanding you need to master the material. Even the brightest business students can find economics intimidating, but the material is essential to a solid grasp of how the business world works. The good news is that you've come to the right place. Peter Antonioni is a senior teaching fellow at the Department of Management Science and Innovation, University College, London, and coauthor of Economics For Dummies, 2nd UK Edition. Manzur Rashid, PhD, is a lecturer at New College of the Humanities, where he covers second year micro- and macroeconomics.